I'm embarrassed to admit this but this recipe was totally inspired by my laziness. I left a can of honey roasted peanuts on the staircase to "take down to the kitchen later". After about the 10th time past them, I thought about the pork loin (NOT pork tenderloin) I had thawing downstairs and KAPOWW! A "you got your peanut butter in my chocolate" idea was born. Or I guess it was more of a "you got your peanuts on my pork" idea. 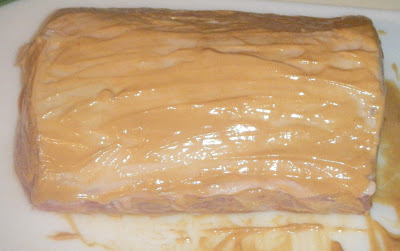 Whisk the wine vinegar into the peanut butter into a smooth mixture. Honey might work with this too. 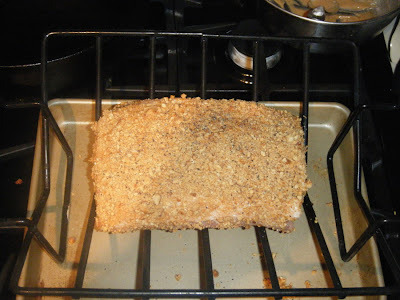 Glaze the pork loin with the mixture like this: In a blender, food processor, or ziplock bag pounded by a mallet, grind peanuts and cayenne pepper together. 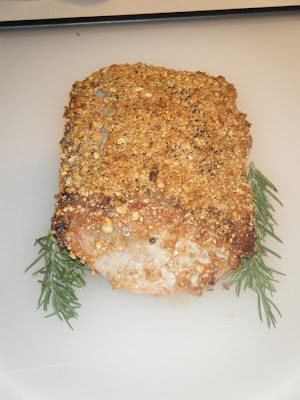 Rub onto the pork loin for a thick crust. Place on a roasting rack into the oven. Roast until the loin is 150f internal. Pull and let it rest for 15 minutes. Slice and serve. The meat was perfectly tender and juicy. The crust rocked with flavor and just the right kick of heat! This is a definite repeat!